I am always skeptical when friends call or text to tell me about a bicycle they discovered at a yard sale. They assume that because the bike in question looks old (i.e., decrepit, cheap, and utterly worthless), that I might be interested. But today, my friend Linda alerted me to a box of bike parts at her neighborhood garage sale. The photo she texted revealed some Campagnolo cranks, but I couldn’t make out the other items. $40 for all – she said. “Okay I’ll take it”, not knowing what the box contained. I shouldn’t be too harsh on my various friends’ enthusiasm. In fact, it is very difficult for a lay person to distinguish between that which is excellent and good and that which should never have been manufactured, the latter of which exists in ubiquity. Campagnolo Record high flange hubset – with rare 120 mm spacing on the rear hub – smooth as butter. 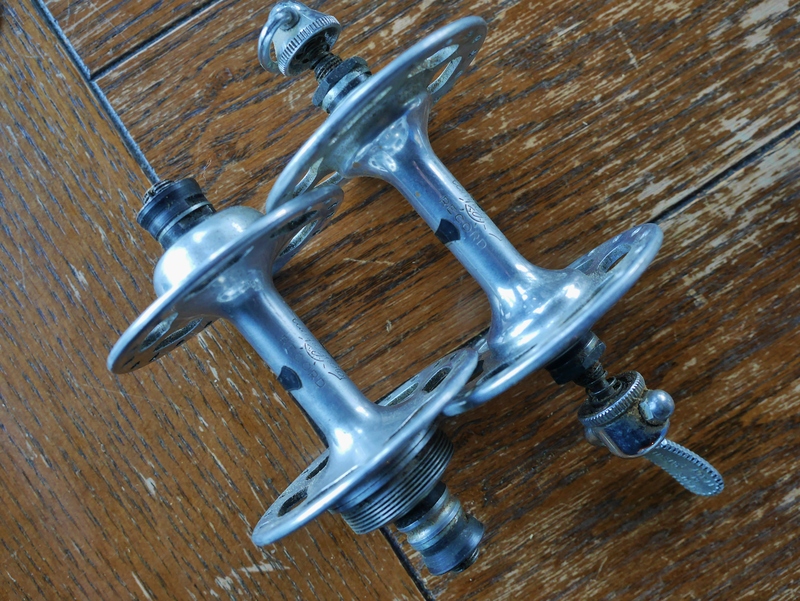 Campagnolo Record front hub – will need some work as the hub doesn’t turn smoothly, but the hub shell is a work of art. 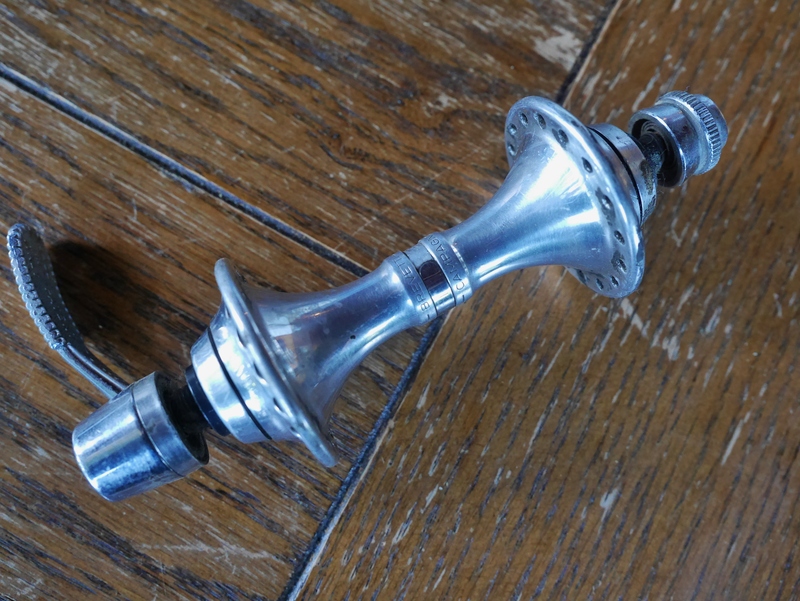 So, discovering that the box contained three Campagnolo Record hubs was a real delight, especially given that the rear high flange hub has 120mm rear spacing, which is now very difficult to find. 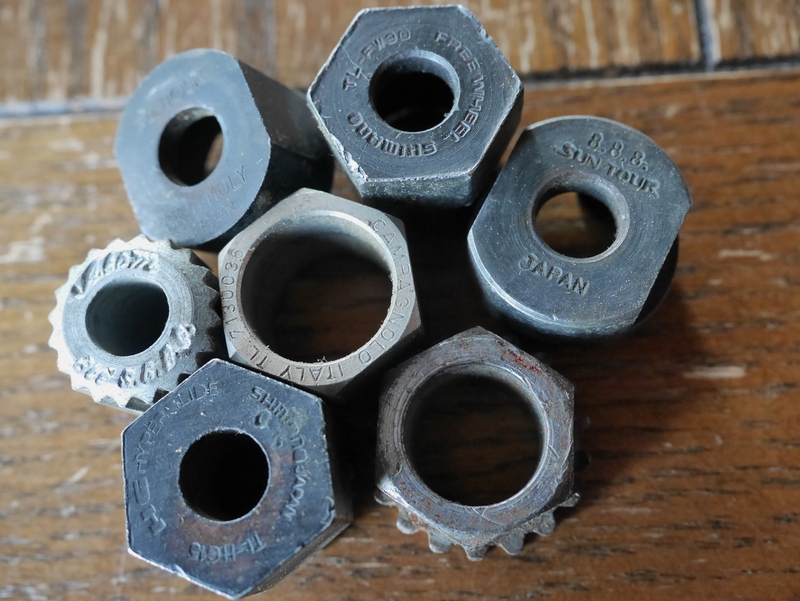 Since vintage bicycles have narrower drop out spacing than modern bikes, the rear hub made the whole deal worthwhile, regardless of what else the mystery box contained. 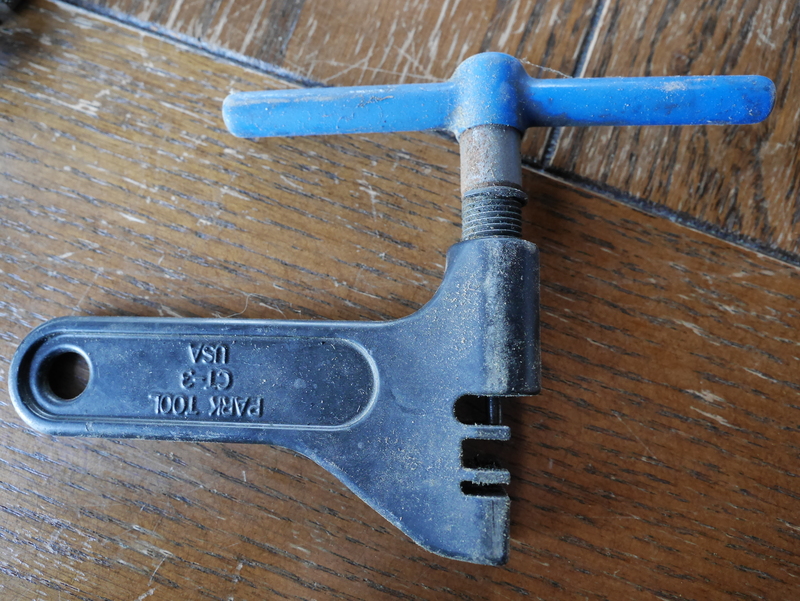 Handtools – Campagnolo and Mafac. 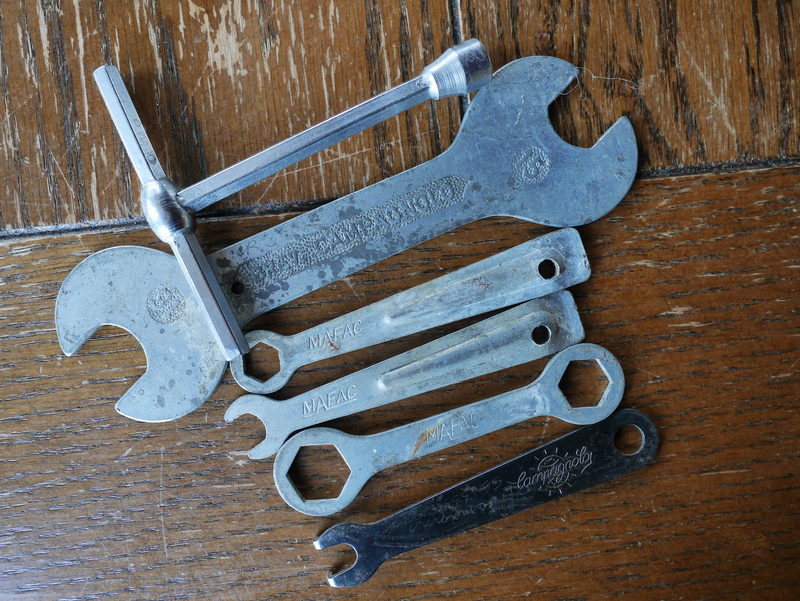 Digging further into the box, I pulled out these wonderful old tools, including some freewheel removal tools that I didn’t already have on hand, plus some great Mafac wrenches. And, it’s always nice to have an extra Park chain tool. 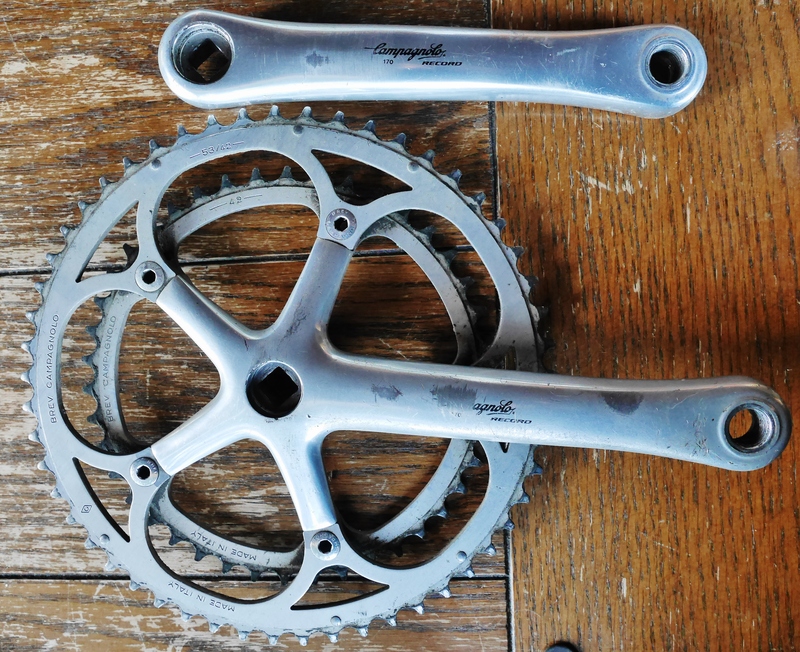 Campagnolo Record square taper crankset. The Campagnolo Record square taper crankset, which served as the lure for my purchase, is pretty scuffed up. The drive side crank arm shows a lot of scratches and wear. 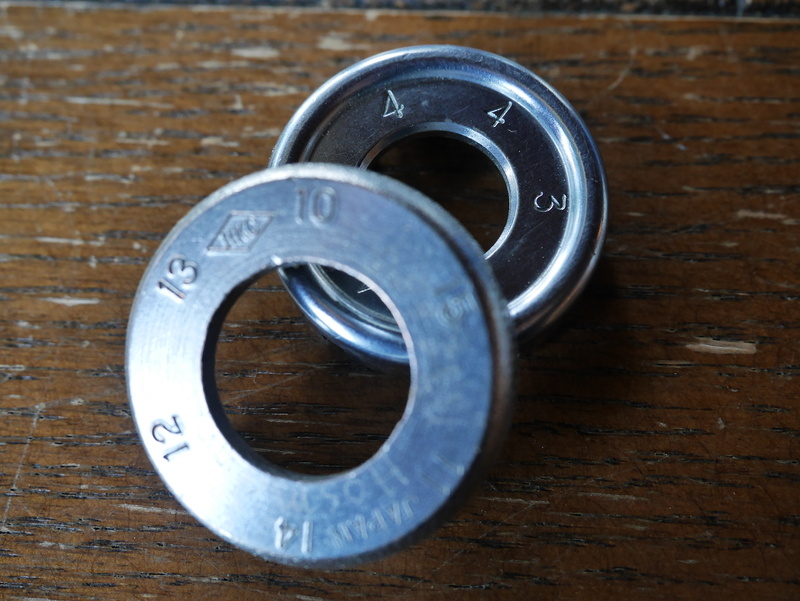 However, the 53/42 rings look like there is still some life left in them, so I may be able to salvage the crankset. I’ll know more once I clean it up. 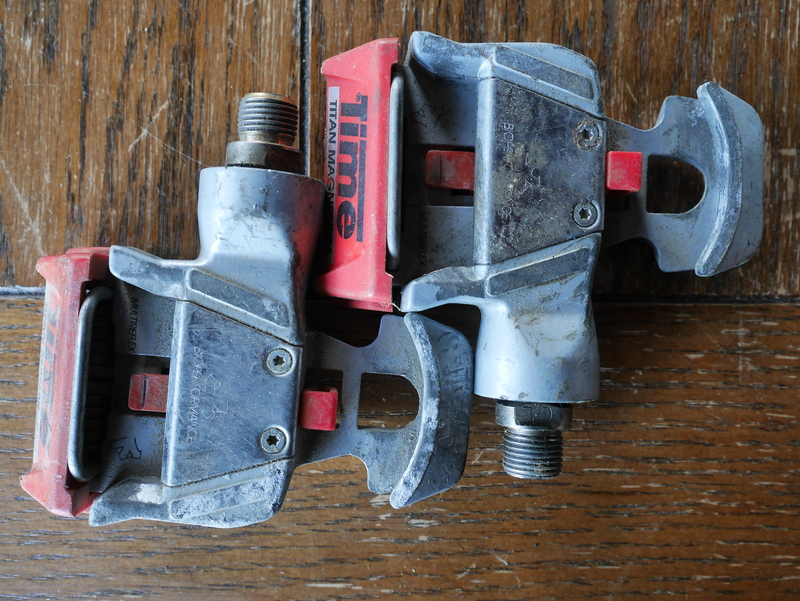 These old clipless racing pedals are dated, so it is doubtful that this item has any value. However, they are VERY lightweight and I can see why these pedals were at one time popular with the racing crowd. If anyone reading this wants them, let me know and I’ll ship them to you, for just the cost of shipping. So, yes, sometimes there are garage sale finds. Unfortunately, they are all too rare. 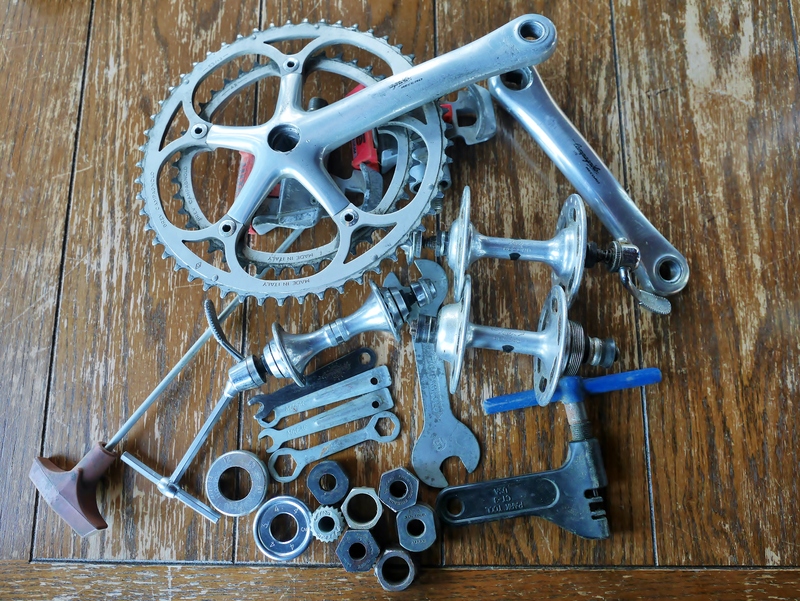 This entry was posted in Bicycle restoration, Tools and Shop Aids, Vintage Italian Bicycle and tagged Bike mechanic tools, Bike shop tools, Camganolo hubs, Campagnolo crankset, Mafac Tools, vintage bicycle tools by Nola Wilken. Bookmark the permalink. ‘Tis the season of garage/estate sale finds! Nice one for $40. You already made your money back with the Campagnolo Record high flange hubset. Sure Tou. Send me your address via email. There’s a contact form on my “About” page. Hello Jay – these items are now in my inventory, except for the pedals which I shipped out to the first person who asked. The high flange hubs will come in handy for a future wheel build, I suspect. $40 for all that lot ? You did really well. You owe your friend a lunch !